There’s a place where lost and abandoned things end up. Not just odd socks from your laundry and keys and other items you’ve misplaced, but bigger things too, even people. It’s known as the Meld. A place outside of time, an inhospitable dimension, where there are those in power subjugating and controlling those who are weaker, and most of reality has no clue this place exists. Joshua is a chrononaut who has a job to do, which is to get to the Meld and assassinate a specific person. Using a time machine from the near future, he ends up in the Meld with damaged machinery and soon finds himself a captive. Before he knows it he finds himself face to face with the very person he needs to kill. There’s also the beautiful and unusual woman who he’s never seen before, but swears he was talking too just as he arrived in the Meld, as if he somehow knew her. While the opening concept for Ei8ht seems interesting at first, the storyline quickly devolves into a predictable guns-firing slugging match between the goodies and the baddies that tends to bore the reader more than it does entertain. Originally written on March 3, 2016 ©Alex C. Telander. 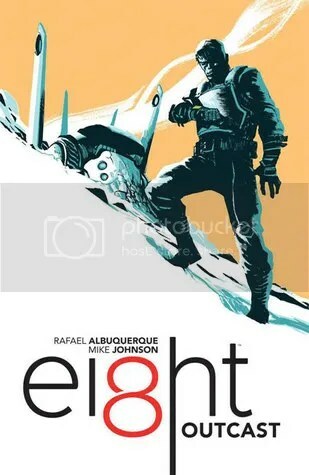 To purchase a copy of Ei8ht Volume 1: Outcast from Amazon, and help support BookBanter, click HERE. 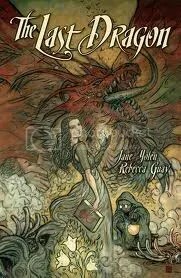 Known kid’s and young adult author, Jane Yolen, teams up with artist Rebecca Guay to present a beautiful and captivating graphic novel story. Two centuries ago the dragons were driven away from the Islands of May, or killed off, but there is one left who has now been awoken and is ravaging the towns, killing the people, with no hope of stopping the giant lizard. It is up to an unlikely character: the healer has gone missing, presumed dead, in search of the dragon, and the healer’s daughter vows to avenge his death. Meanwhile messengers are sent out to explore the lands for a true hero, one who can slay the dragon. Some are found, but proved cowards, until the last who is just the sort of hero they’re looking for; only the man seems to be more of bluster and talk than of actual skill, strength and prowess. The healer’s daughter and the supposed hero join forces, using their abilities and intelligence to come up with a way to defeat the dragon involving a most unusual and giant sized kite. The art of The Last Dragon is enchanting, in the style of Neil Gaiman’s and Charles Vess’ Stardust, that has the classic feel of a beautifully illustrated story tale, combined with the moving story and some interesting characters that would never be brought together if it weren’t for the events of the story. The Last Dragon is a great book to read to and show to children, as well as to be enjoyed by anyone who’s a fan of the fantasy genre. Originally written on December 30, 2011 ©Alex C. Telander. 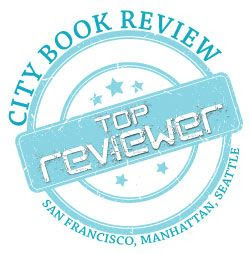 To purchase a copy of The Sword: Fire from Amazon, and help support BookBanter, click HERE. Writer and artist Jeff Smith, of Bone fame, returns with an original concept in Rasl. In The Drift, Rasl is a classic young tough guy who’s been messing around with magnets and magnetic fields and has invented a way of traveling across dimensions into parallel universes. It takes a lot out of him each time he drifts, explaining his alcoholic ways. For his occupation, Rasl is an art thief, stealing art from other dimensions to sell in his own. But in this first volume, something is terribly wrong. There’s an assassin out to get him, following him somehow across the dimensions. It’s nonstop action for Rasl, as he tries to save his skin, while continuing to research the powers of magnetism that make it possible to cross the dimensions of space. 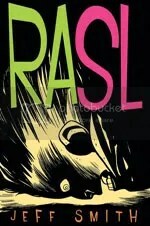 Rasl is a great new story from Jeff Smith, who will be publishing two more volumes in the series. Originally written on February 3rd, 2009 ©Alex C. Telander. 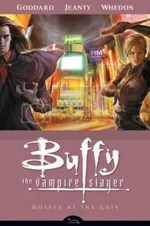 The latest collected volume of Buffy the Vampire Slayer Season 8 features a single issue scripted by Joss Whedon, as Buffy comes to a startling realization with her personal life that mixes with her job as the lead slayer over all the Chosen. The development continues in the Wolves at the Gate series as an attack is made on the Chosen base in Scotland by a horde of vampires that can turn into wolves, fog, and even a swarm of bees. Enlisting the help of a very old and forgotten friend who is a natural wealth of information on the events at hand, Buffy travels to Japan with her powerful army to find out who or what is behind the group of Goth Japanese vampires who have these incredible powers. Wolves at the Gate continues Buffy’s adventures in classic fashion, with all the main characters, leaving the reader impatiently waiting for the next collection, as well as to some possible answers to why Buffy is doing what she is doing, and what’s behind it all. Clearly the writers have a master plan building that will hopefully see more light in the next trade coming in May. Originally written on January 10th, 2009 ©Alex C. Telander. In this original story from Neil Gaiman and Michael Zulli, who have collaborated before on graphic novels, we see the story of Miss Finch and her enigmatic disappearance as recounted through the eyes and memories of those who witnessed it. The tale begins with the narrator and his two friends, a couple, who wish him to join them and Miss Finch on a fun night out. The man grudgingly agrees and is surprised when he meets Miss Finch, who is a strange and unique looking woman, giving nothing of herself away except for her mysterious attire. They decide to go to this circus they’ve heard about, which is unlike anything ever done before. With a total of fifty people, they enter into the main room after finding the front door to the basement of a run down building. They are soon greeted to an introductory show of many strange creatures in many colors and looks. Everyone assumes them to be people in costumes, but they do look uncannily realistic. They are then greeted by the man in charge who bears more than a striking resemblance to Alice Cooper, who guides them to the first of many rooms where bizarre events are taking place. There is the breathtaking knife throwing act; the Frankenstein-like creature with incredible strength; the room of black light creatures that again seem too real; and the room with the strange guillotine act. 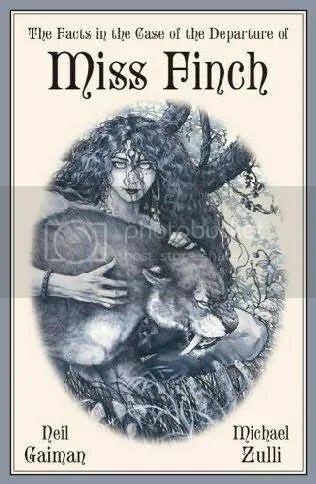 After taking a break at what seems like the end, the four members find themselves alone and enter into another room where they are greeted by darkness and then wild animals and a wild woman who looks familiar. Thinking they are about to die, the room turns to black and they leave the room only to find Miss Finch is no longer with them. The Facts in the Case of the Departure of Miss Finch is a strange story that makes one question what one is actually seeing, what is supposed reality and what is not. Through the skillful writing of Gaiman and the haunting artistic style of Zulli, it is a book that leaves a lasting impression on the reader. Buffy and Joss Whedon fans were delighted to discover that there would be a graphic novel version of Buffy the Vampire Slayer, continuing on from the end of the show. 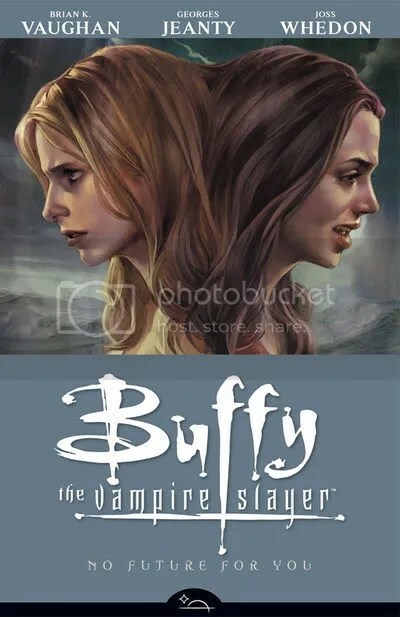 But fans also know there are two true slayers currently alive in the Buffyverse, and in No Future For You, with help from writer Brian K. Vaughan (of Y: The Last Man) we get the story on what the other slayer has been up to. Watcher’s Council extraordinaire Rupert Giles needs the help of Faith, the other slayer who has always seen Buffy as the perfect blond who can do no wrong, while she is a convicted murderer, and has had to fight for everything in her life. But Giles has a mission for her now: to infiltrate the mansion of a rich family in England and take out a girl who is using all her power and resources to kill slayers and anyone with slayer abilities. Faith will have to go through a rigorous training process in being a proper English noble. She will also have her faith tested in being a good person, as she finds she has a lot in common with this girl who wants to put an end to Buffy. Meanwhile back in the castle where Buffy is, Dawn still has her “giant” problem, Xander is making with the hilarities, while Willow continues to be an awesome witch with a scary amount of power, and there is the strange sigil that continues to have deep and sinister ties. The graphic novel story continues to be an entertaining tale as good as the original TV series. With the incredible DVDs sales and cult success of Firefly, as well as the popular movie Serenity, fans are always looking for something more, which is why they should pick up the beautiful new hardcover edition of Serenity: Those Left Behind. Originally released as a three-issue comic series to link up the end of the Firefly series with the Serenity movie, Those Left Behind features amazing artwork that makes it feel like you’re watching the show again. This edition begins with a great introduction by Nathon Fillion (who played Captain Malcolm Reynolds) as he relives his childhood of reading comic books, how important they were to him, and what it was like to want to be a superhero; and how on the day that Joss Whedon cast him as Mal, he knew his dream had been achieved. Each of the covers from the original comics are shown at the beginning of each issue, making up the entire crew, as it is explained how Inara and Shepherd eventually chose to leave the ship, as well as another grand adventure involving the whole crew. In this edition also is a true gem: a pre-production memo that Whedon wrote for the making of Serenity titled “A History of the Universe, Circa 2516 A.D.” Here we see Whedon’s ideas for where the characters came from, their histories, and what led up to them all being on the same ship. The history of the universe is also explained, with the creation of the Alliance and the rebels who fought for freedom. Also included is some original concept artwork for the movie. 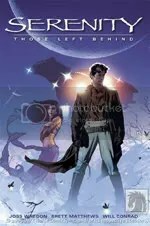 Serenity: Those Left Behind is a wonderful graphic novel that goes much further than the story told in the original three-issue comic series, with incredible artwork, and gives fans and readers a sliver of hope that maybe, one day, there may be more to be told about Serenity and her special crew. Originally written on December 6th, 2007 ©Alex C. Telander.